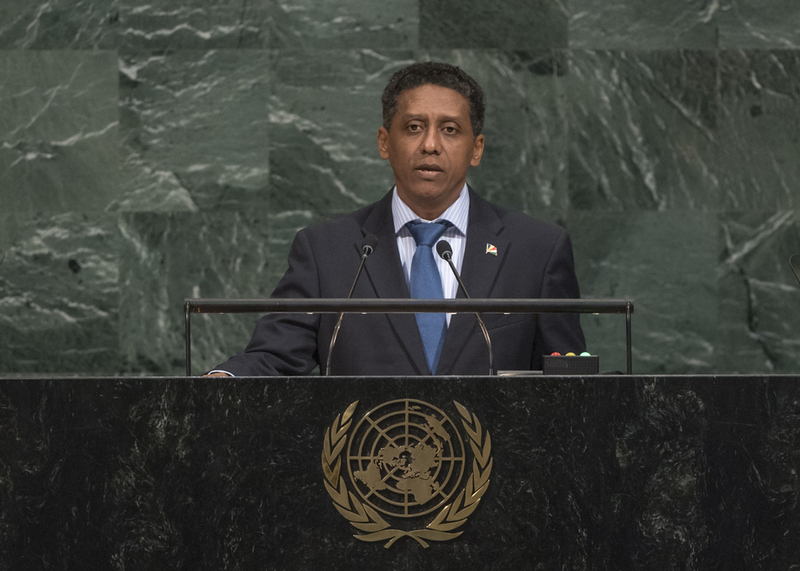 DANNY FAURE, President of Seychelles, said the Assembly’s theme of “Focusing on People” could not be achieved without effective implementation of the principles of democracy and a concerted demonstration of will. Such efforts also called for good governance, transparency and accountability, which were the foundations for prosperity and security. Space must be created within societies where diverging views and ideas could flourish and be respected, he said, adding that, by doing so, unity, tolerance and respect would all be promoted. He said that, for the first time in its history, Seychelles was experiencing a system of political cohabitation, whereby he served as President and head of the Government’s executive branch, and worked with a legislature dominated by the opposition. That dynamic, characterized by dialogue and consultation, worked well. Most importantly, the relationship was based on mutual respect. The Government was being reshaped to be more inclusive, with an emphasis on the empowerment of citizens, especially youth. The environment for free media was being improved and legislation related to institutions, authorities and agencies was being amended. With greater transparency, good governance and accountability, the independence of institutions and authorities would continue to increase. He said the goals of peace and a decent life for all on a sustainable planet would not be met solely by increasing financial, human or other resources for the implementation of the 2030 Agenda or the Paris Agreement. Those processes should be democratically governed, underpinned by transparency and accountability, with respect for the natural environment. In Seychelles, the private sector, civil society, non-governmental organizations and parliamentarians had joined with the public sector in a national effort to integrate the global development agenda into the national budget and development plans. Further efforts were under way to integrate the 2030 Agenda with the African Union Agenda 2063 and the Samoa Pathway for small island developing States. A similar inclusive approach was required for implementation of the Paris Agreement, he said, stressing that all stakeholders must be involved if the international community was to drastically scale up its climate action. The world could not afford to renege on the collective commitment to “travel the moral path” for the sake of humanity. From small islands came big ideas, he said, citing the agreement Seychelles had reached with the Paris Club of creditor countries on a first-of-its-kind $21 million debt-for-adaptation swap to protect 30 per cent of its exclusive economic zone. The country also aimed to launch the world’s first “blue bonds” by the end of the year to raise another $15 million for sustainable fishing practices. Both those measures sought to establish innovative sources of financing to implement Goal 14 on oceans and seas.